This project is a program to load GoldSrc BSP files. The GoldSrc BSP file format has been derived from the id’s Quake 2 file format by Valve Software for their Half-Life game series. 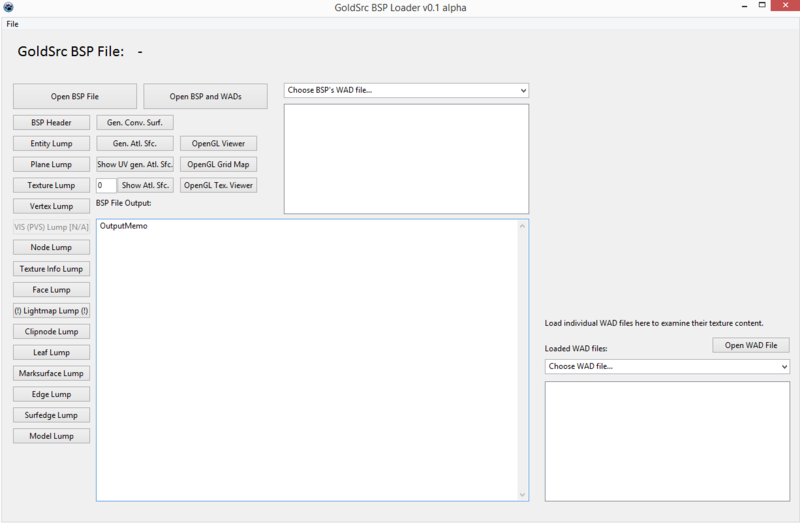 The BSP Loader powered by Lazarus. Loading a WAD file and displaying a selected texture from it. Textured rendering of a scene (estate). The blue colorkey is not interpreted to be transparent yet. I cannot state how important these documents were in understanding the structure of the BSP and WAD file formats. Without them, this project wouldn’t have been possible. I used the SupraEngine.Math Unit by Benjamin ‘BeRo’ Rosseaux (benjamin@rosseaux.com) for this. 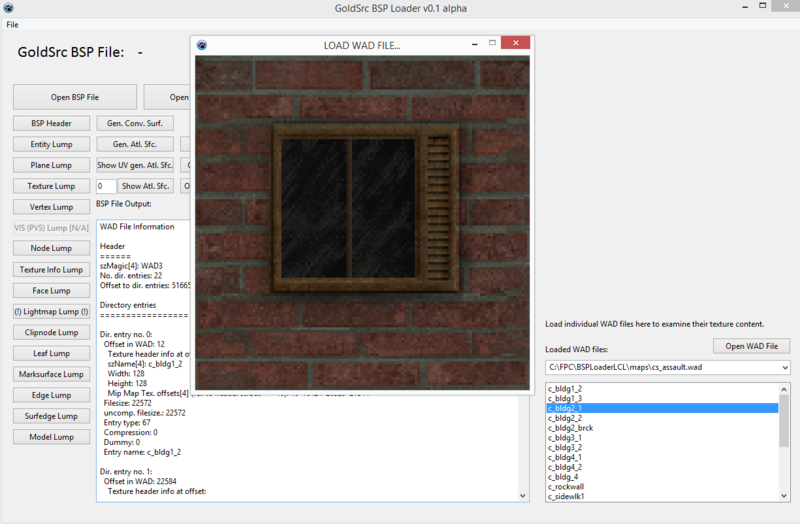 Loading of bitmap image files (BMP files) is natively supported by SDL2. The way to go is as follows (from the flow diagram). This image by https://www.freepascal-meets-sdl.net is licensed under a Creative Commons Attribution 4.0 International License. Flow diagram of the loading and rendering of a bitmap file in SDL2. Let’s start on the left in the diagram. The easiest way to get a bitmap (BMP) image file for a game or application ready for usage is to create one in a drawing application. Or use the example bitmap “fpsdl.bmp” we used in the code. The original image is 200×200 pixels wide. The bmp image file is stored on your hard drive and can be loaded by SDL_LoadBMP function to a SDL2 surface. This SDL2 surface is then transformed into a SDL2 texture by SDL_CreateTextureFromSurface function (whose name is just explaining what is does). And finally this texture is rendered by SDL_RenderPresent, this function we know already. And now let’s see how it is done in code. program SDL_LoadingRenderingBMP; uses SDL2; var sdlWindow1: PSDL_Window; sdlRenderer: PSDL_Renderer; sdlSurface1: PSDL_Surface; sdlTexture1: PSDL_Texture; begin //initilization of video subsystem if SDL_Init(SDL_INIT_VIDEO) < 0 then Halt; if SDL_CreateWindowAndRenderer(500, 500, SDL_WINDOW_SHOWN, @sdlWindow1, @sdlRenderer) <> 0 then Halt; // create surface from file sdlSurface1 := SDL_LoadBMP('fpsdl.bmp'); if sdlSurface1 = nil then Halt; // create texture from surface sdlTexture1 := SDL_CreateTextureFromSurface(sdlRenderer, sdlSurface1); if sdlTexture1 = nil then Halt; // render texture if SDL_RenderCopy(sdlRenderer, sdlTexture1, nil, nil) <> 0 then Halt; // render to window for 2 seconds SDL_RenderPresent(sdlRenderer); SDL_Delay(2000); // clear memory SDL_DestroyTexture(sdlTexture1); SDL_FreeSurface(sdlSurface1); SDL_DestroyRenderer(sdlRenderer); SDL_DestroyWindow (sdlWindow1); //closing SDL2 SDL_Quit; end. This is the result of the code. contains two new variables, namely “sdlSurface1” and “sdlTexture1” of the pointer types PSDL_Surface and PSDL_Texture, respecitvely. 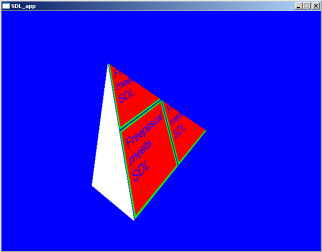 After setting up SDL2, a window and a renderer as known, we find this. and return nil on error, e.g. if the file is not found. The next step is to get a SDL2 texture. That’s achieve as follows. 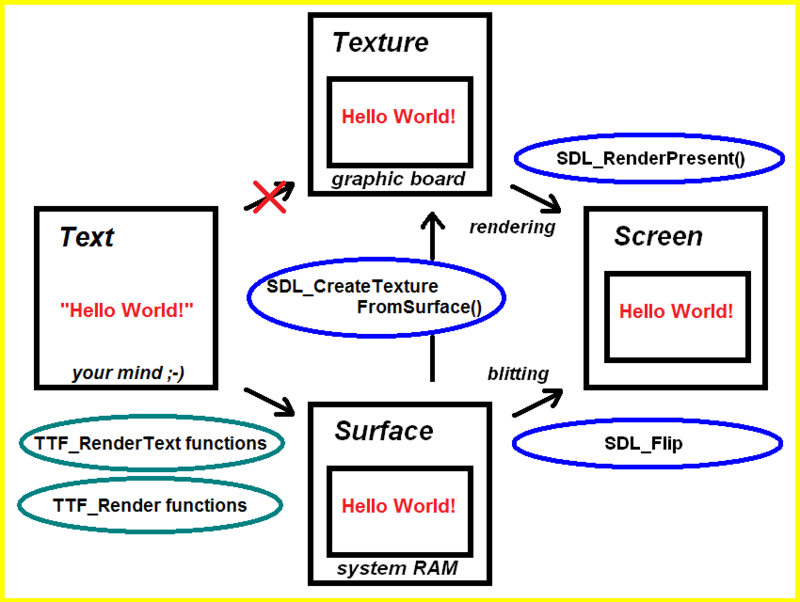 The function to use is SDL_CreateTextureFromSurface(renderer, surface). It just does what you expect and transforms the SDL2 surface into a SDL2 texture with the help of the given renderer. Before actually rendering the texture, we need to copy it to the rendering target (our window) by SDL_RenderCopy(renderer, texture, source rectangle (texture), destination rectangle (rendering target)). So the texture is copied to the rendering target (which is the window). The first nil argument means that we want to copy the whole rectangle. The second nil means that we want to copy to the whole dimensions of the rendering target. Let’s have a closer look at the function. You see here, that you could use arguments of type PSDL_Rect, which basically describes rectangles. And finally the rendering is done by the known SDL_RenderPresent(). It is important to free the memory occupied by the surface and texture by SDL_FreeSurface(surface) and SDL_DestroyTexture(texture) right after . Remark: DO NEVER combine SDL_CreateTextureFromSurface() and SDL_LoadIMG! This will run without any problem, though SDL_CreateTextureFromSurface() will not free the surface created by SDL_LoadBMP(). And you have no handle to free this surface. This creates a memory leak. This chapter treats some basics you should know to understand the way SDL2 works. Left: Window is cleared between each new drawn frame. Right: Window is not cleared. Actually there are just three locations where these images are stored in your computer system. All images (photo images, drawings, sprites for 2d games, textures for 3d games) are stored on your harddrive somewhere. If you start a photo viewer, a paint program, a 2d game or a 3d game, in all cases the corresponding images need to be loaded from your harddrive to RAM (Random-Access Memory) since displaying and manipulation (e.g. rotation of a photo image by 90°) of images loaded to RAM is much, much faster. Especially for games a fast access to the image data is highly important! And finally there isn’t just one RAM but two, a CPU controlled one located on the motherboard used by every program/application that needs some RAM. The second RAM is located right at your graphic board and controlled by the so-called GPU (graphics processing unit). This is what we want to use if we develop games since it is dedicated, optimized and just hungry for tasks related to fast image processing. Many games and applications do not only target at common computer systems, but for mobile devices, e.g. smart phones. The principles described are also true for these devices even though there may be differences in detail. The SDL2 surface allows you to represent graphic objects like sprites. Every SDL2 surface has a width and height, a pixel format and other properties. Nevertheless, it is a concept which originates from the outdated SDL 1.2 and therefore should not be used anymore. Still, there are reasons why we need to introduce it here. This will be clear soon. The SDL2 texture allows you to represent graphic objects just like the SDL2 surface does, although there is a major difference: It is hardware accalerated. So the graphic object is stored in the graphic board’s RAM and any manipulation is done by the graphic board’s GPU. then you go for high performance! So, how to get a SDL_Texture? In principle there are three ways to create SDL2 textures. For way 2 and 3 the flow diagram may illustrate how it works. You create a SDL_Texture from scratch, so you set a pixel format and texture access format and have to fill in your texture data manually. This is the most sophisticated way and is usually not necessary, unless you work with raw pixel data. Way 2: The path from the file to the surface, to the texture and to the screen. Way 3: The path rom the file to the texture and to the screen. 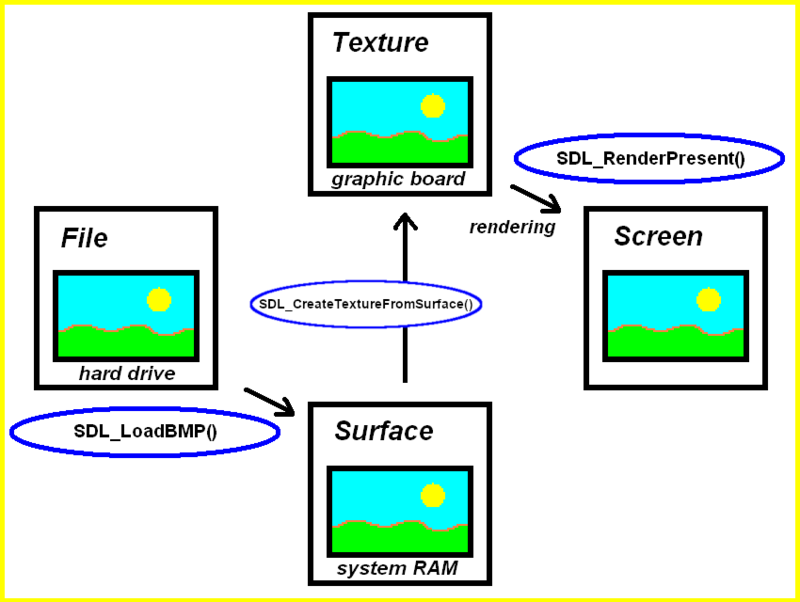 2) You have or create a SDL_Surface from an image file first and then you create the SDL_Texture from the SDL_Surface. This way is shown in the diagram but it means two steps. 3) You create a SDL_Texture from and image file directly. This is shown in the diagram, too. This is the simplest way to create a SDL_Texture. Image files to use in games and applications often are available in other formats than simple bitmap files (e.g. jpg, png, tif and so forth), because often bitmap files need a significant higher amount of disk space memory. Also it would be desirable to load an image file directly and create a SDL2 texture from it instead of firstly creating a SDL2 surface and then creating a SDL2 texture from the surface (as seen in the chapter about bitmap loading). These features are obviously not part of native SDL 2.0. SDL2_image is an official extension of SDL 2.0, which is developed and maintained by the same developers. Therefore, before right jumping into the code we need the corresponding library files. Download the corresponding SDL2_image package depending on your system (32 bit or 64 bit) and extract the file. You will end up with a SDL2_image.dll and some further dlls which are necessary for support of some image formats. Copy all these files to your system folder, e.g. for Windows XP 32 bit C:\WINDOWS\system32\. If you are not sure about your system folder, you should copy all these files to the same folder where the source code file (.pas or .pp) of your SDL 2.0 program is. 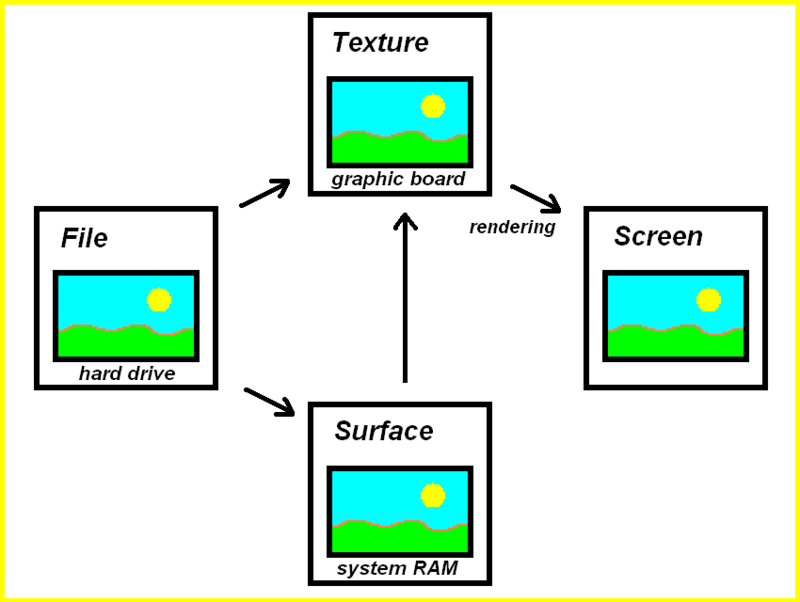 An image file (left) can be loaded as a surface or a texture and then be rendered to the screen. Have a look at the flow diagram below which is an extended version of the diagram seen in the chapter about loading of bitmap files. You see it is extended by two function with the prefix IMG instead of SDL, namely IMG_LoadTexture() and IMG_Load(). Both of these functions allow to load image files of all the supported file formats mentioned above. Also you see that IMG_LoadTexture() creates a texture directly from the image file, so we skip the step of first creating a SDL2 surface from the image file. Let’s try the following image files (dimensions: 200 x 200 pixels, formats: bmp, jpg and png) but feel free to use any other image file you like. program Chapter4_SDL2; uses SDL2, SDL2_image; var sdlWindow1 : PSDL_Window; sdlRenderer : PSDL_Renderer; sdlTexture1 : PSDL_Texture; begin //initilization of video subsystem if SDL_Init( SDL_INIT_VIDEO ) < 0 then HALT; sdlWindow1 := SDL_CreateWindow( 'Window1', 50, 50, 500, 500, SDL_WINDOW_SHOWN ); if sdlWindow1 = nil then HALT; sdlRenderer := SDL_CreateRenderer( sdlWindow1, -1, 0 ); if sdlRenderer = nil then HALT; sdlTexture1 := IMG_LoadTexture( sdlRenderer, 'C:\fpsdl.bmp' ); if sdlTexture1 = nil then HALT; SDL_RenderCopy( sdlRenderer, sdlTexture1, nil, nil ); SDL_RenderPresent (sdlRenderer); SDL_Delay( 2000 ); SDL_DestroyTexture( sdlTexture1 ); SDL_DestroyRenderer( sdlRenderer ); SDL_DestroyWindow ( sdlWindow1 ); //shutting down video subsystem SDL_Quit; end. Well, here it is. 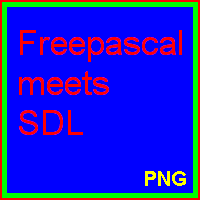 This code will create a window of dimensions 500 x 500 pixels which is showing the “Freepascal meets SDL” image for two seconds. After that the window closes automatically. The following screenshot shows the result of the example program. Now let’s get into the code step by step. The light blue marked lines indicate the code lines which will be discussed afterwards. For better orientation in the code, the whole code is still shown. Now the first eight lines are discussed. Well, the first line starts a Pascal program as usual. In contrast to the previous chapter, the uses clause is extended by SDL2_image. To be clear again, native SDL 2.0 has no support for different image formats, except for BMP image files. Although native SDL 2.0 allows for loading of BMP image files, it just allows for creation of SDL_Surfaces, but we would like to create SDL_Textures. We need a texture variable to which we can load the image information of an image file. This will be “sdlTexture1” of PSDL_Texture type. All these variable types are pointer types which is indicated by the captial “P” at the beginning of the variable types’ names. As any Pascal program the main program’s begin-end block is initiated by “begin”. The initilization of SDL 2.0 is started as discussed in detail in the last chapter by SDL_Init(). After successful initialization of SDL 2.0 a window with title “Window1” and a renderer is created as known from a previous chapter. This function is provided by SDL2_image. Its prefix is IMG instead of SDL for native SDL 2.0 functions. That function is why we needed to insert SDL2_image in the uses clause. The parameters of this function are a renderer, that is “sdlRenderer” for us, and as a second the absolute or relative path to an image file, for us it is “C:\fpsdl.bmp”. Of course you may use any other directory to store/load the image or even use a different image. The function will recognize the image file’s format automatically, so feel free to load any of the allowed formats. If the loading fails, for instance you gave a wrong path as argument, this function will return nil. SDL_RenderCopy(renderer: PSDL_Renderer; texture: PSDL_Texture; srcrect: PSDL_Rect; dstrect: PSDL_Rect): SInt32. At first this function asks for a renderer (and indirectly for the related window) to which we would like to copy the texture. In our case this will be “sdlRenderer” again. Next the texture to be copied to the renderer/window is required, this is “sdlTexture1” here. The last two parameters are named “srcrect” and “dstrect” and of type PSDL_Rect. 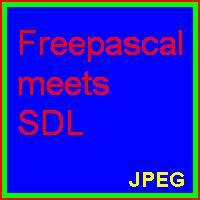 PSDL_Rect is a SDL 2.0 predefined record to define rectangles, hence the name. I will not go into details about this here, but in the next chapter (Chapter 5) we will learn more about PSDL_Rect, although it will be in another context. For simplicity we just use nil as argument here. This makes the function to pass the full texture to the renderer/window and stretching it to the dimensions of the window. So the 200 x 200 pixel image is strechted to 500 x 500 pixels, the latter being the width and height of the window. This function returns 0 on success and the negative error code on failure. After removing the objects from memory, SDL 2.0 has to be quit as seen in the previous chapter. Wow, we finally made it. Congratulations, this chapter is finished :-). The next chapter is waiting though. This is an SDL 1.2 chapter. SDL 1.2 is obsolete since it has been replaced by SDL 2.0. Unless you have good reasons to stay here you may prefer to go for the modern SDL 2.0 :-). It is highly recommended that you read the previous Chapter 8. The code from last chapter was used and modified to show how the conversion works. However, I won’t explain twice everything already introduced in Chapter 8. Also I’d like to express here that NeHe Productions’ OpenGL tutorial 06 “Texture Mapping” and the translated (by Dominique Louis) Jedi-SDL file was inspiring me a lot for this chapter. 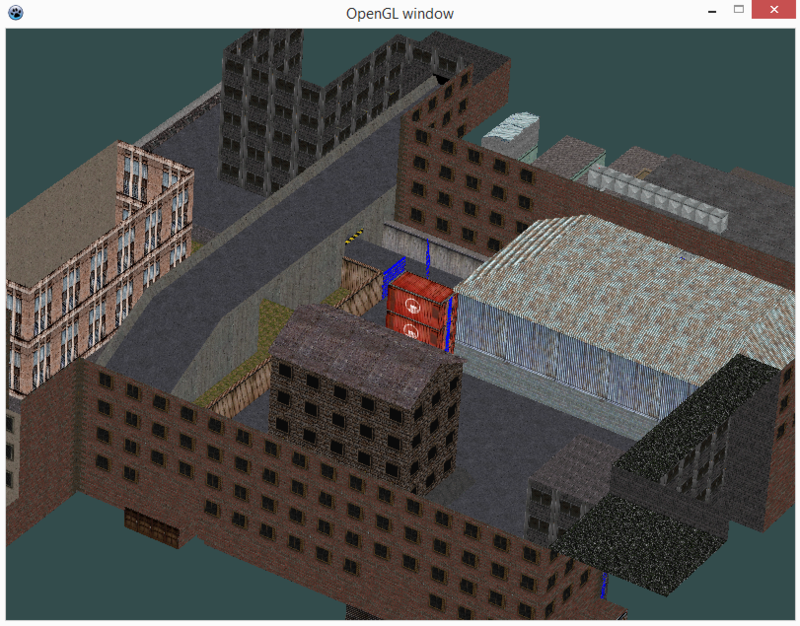 OpenGL driver – – Usually your graphic card provides the corresponding OpenGL driver and you don’t have to do anything. And if so it is very likely that version 1.1 is fully supported. However if you are one of the few poor people whose graphic card doesn’t support OpenGL, check the graphic card’s manufacturer’s homepage for OpenGL drivers. Now following the whole code at once as usual. As you will notice many lines are exactly the same as in Chapter 8. 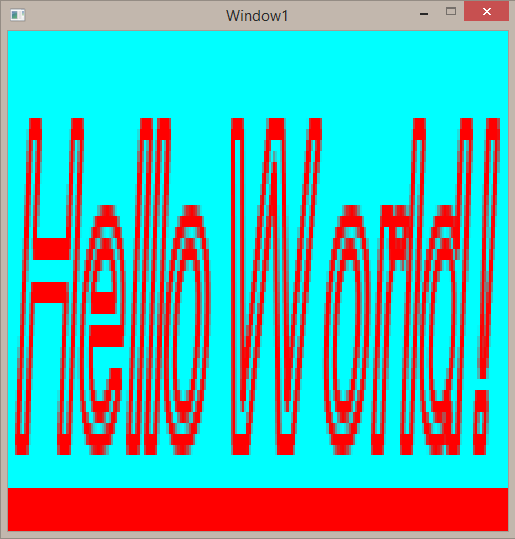 PROGRAM chap8a; USES CRT, SDL, GL, GLU; VAR userkey:CHAR; screen, picture:pSDL_SURFACE; h,hh,th,thh:REAL; ogl_texture:pGLUINT; BEGIN //some calculations needed for a regular tetrahedron with side length of 1 h:=SQRT(0.75); //height of equilateral triangle hh:=h/2; //half height of equilateral triangle th:=0.75; //height of tetrahedron thh:=th/2; //half height of tetrahedron SDL_INIT(SDL_INIT_VIDEO); SDL_GL_SETATTRIBUTE(SDL_GL_RED_SIZE, 5); SDL_GL_SETATTRIBUTE(SDL_GL_GREEN_SIZE, 5); SDL_GL_SETATTRIBUTE(SDL_GL_BLUE_SIZE, 5); SDL_GL_SETATTRIBUTE(SDL_GL_DEPTH_SIZE, 16); SDL_GL_SETATTRIBUTE(SDL_GL_DOUBLEBUFFER, 1); screen:=SDL_SETVIDEOMODE(640, 480, 0, SDL_OPENGL); IF screen=NIL THEN HALT; //preparing SDL image picture:=SDL_LOADBMP('C:\fpsdl256.bmp'); IF picture=NIL THEN HALT; //preparing OpenGL texture NEW(ogl_texture); glGENTEXTURES(1, ogl_texture); glBINDTEXTURE(GL_TEXTURE_2D, ogl_texture^); glTEXIMAGE2D(GL_TEXTURE_2D, 0, 3, picture^.w, picture^.h, 0, GL_RGB, GL_UNSIGNED_BYTE, picture^.pixels); glTEXPARAMETERi(GL_TEXTURE_2D, GL_TEXTURE_MIN_FILTER, GL_LINEAR); glTEXPARAMETERi(GL_TEXTURE_2D, GL_TEXTURE_MAG_FILTER, GL_LINEAR); SDL_FREESURFACE(picture); glCLEARCOLOR(0.0, 0.0, 1.0, 0.0); glVIEWPORT(0,0,640,480); glMATRIXMODE(GL_PROJECTION); glLOADIDENTITY; gluPERSPECTIVE(45.0, 640.0/480.0, 1.0, 3.0); glMATRIXMODE(GL_MODELVIEW); glLOADIDENTITY; glCLEAR(GL_COLOR_BUFFER_BIT); glENABLE(GL_CULL_FACE); glTRANSLATEf(0.0, 0.0, -2.0); REPEAT SDL_DELAY(50); glROTATEf(5, 0.0, 1.0, 0.0); glCLEAR(GL_COLOR_BUFFER_BIT); //drawing textured face of tetrahedron glENABLE(GL_TEXTURE_2D); glBEGIN(GL_TRIANGLES); glTEXCOORD2f(2,2); glVERTEX3f(thh, 0.0, 0.0); glTEXCOORD2f(0,0); glVERTEX3f(-thh, hh, 0.0); glTEXCOORD2f(0,2); glVERTEX3f(-thh, -hh, 0.5); glEND; glDISABLE(GL_TEXTURE_2D); //drawing remaining three untextured faces glBEGIN(GL_TRIANGLES); glCOLOR3f(0.0, 1.0, 1.0); glVERTEX3f(thh, 0.0, 0.0); glVERTEX3f(-thh, -hh, -0.5); glVERTEX3f(-thh, hh, 0.0); glCOLOR3f(1.0, 0.0, 1.0); glVERTEX3f(thh, 0.0, 0.0); glVERTEX3f(-thh, -hh, 0.5); glVERTEX3f(-thh, -hh, -0.5); glCOLOR3f(1.0, 1.0, 1.0); glVERTEX3f(-thh, -hh, 0.5); glVERTEX3f(-thh, hh, 0.0); glVERTEX3f(-thh, -hh, -0.5); glEND; SDL_GL_SWAPBUFFERS; UNTIL keypressed; glDELETETEXTURES(1, ogl_texture); DISPOSE(ogl_texture); SDL_QUIT; END. This code will again draw a tetrahedron which is spinning, as known from Chapter 8. However, this time one face is textured with the “Free Pascal meets SDL” image known from Chapter 3. Now lets go through the code step by step. The program is called “chap8a”. Additionally to the variables defined in the previous chapter there are two new variables. 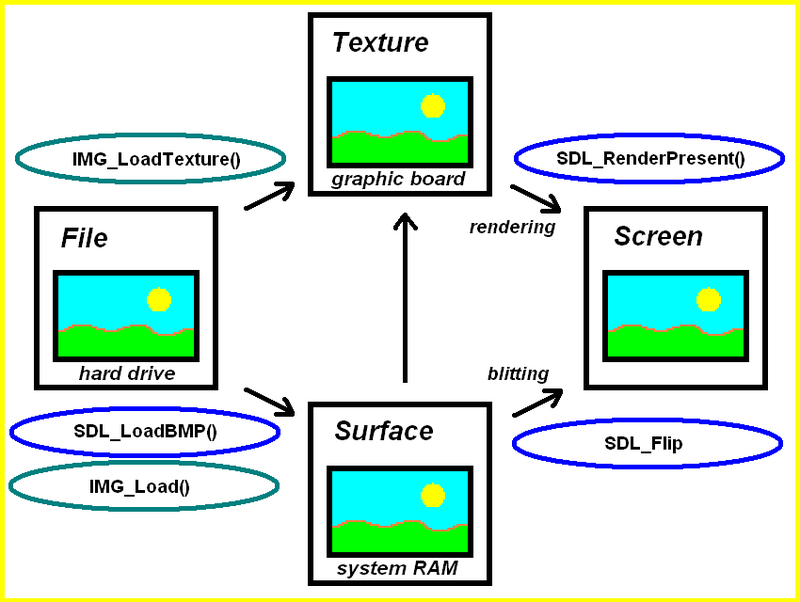 The SDL surface “picture” which will store the SDL image before converting it to an OpenGL texture. 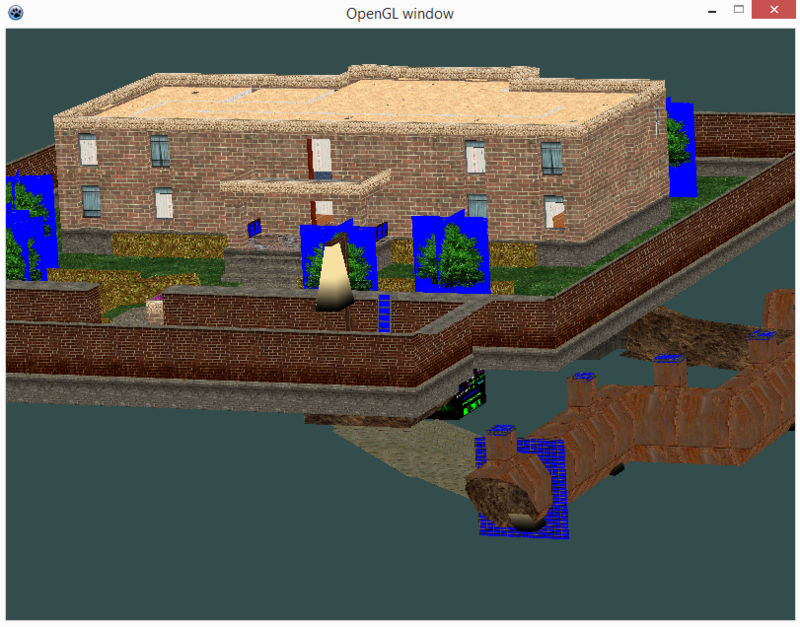 ogl_texture is an integer pointer variable (provided by the OpenGL Uitility Library (GLU), so pGLUINT) which is needed to reference to the OpenGL texture we will create from the SDL image. The code shown here is discussed in detail in Chapter 8. In short the tetrahedron parameters are calculated, some important OpenGL scene settings are applied and finally the SDL video subsystem is intilized. 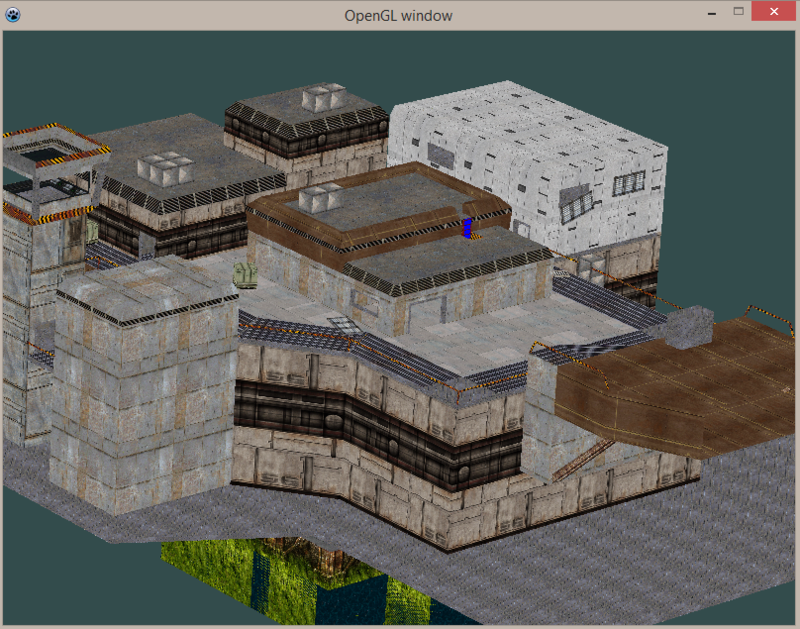 First the pointer “ogl_texture” gets some space. glGENTEXTURES(number of IDs, array of integer pointer) generates one or more OGL integer identifiers for textures. Anyway, we just have one texture, so we just need one texture identifier, therefore we request “1” and ogl_texture should point at it. If we need to identify the texture we just need to call ogl_texture from now on. glBINDTEXTURE(target, texture) essentially creates a texture object of type: GL_TEXTURE_1D or GL_TEXTURE_2D. Usually textures in 2d and 3d games are two-dimensional, so GL_TEXTURE_2D is a good choice. Now it is clear, ogl_texture will be a 2d texture. Briefly, glTEXIMAGE2D(target, mipmap level, internal image format, width, height, border, pixel format, pixel type, actual pixel data) creates the actual 2d texture. The target is GL_TEXTURE_2D again since we are looking for creating a 2d texture. The mipmap level should be set to 0 because we wouldn’t want to have a mipmap effect here. A higher number corresponds to the number’s mipmap level, anyway in the example for a number different from 0 there is no image at all finally. The internal image format is RGB because the image is a RGB image, anyway there is a large list of possibilities for this parameter, you should look it up in the internet if you’re interested. The width and height of the image in pixels is received from the SDL image. The border is off (values 0 and 1 are acceptable). The pixel format is RGB, too, so again SDL_RGB is the right choice here. The pixel explains how the pixel data is stored. The pixel data from the SDL image is stored as unsigned byte (GL_UNSIGNED_BYTE). Finally the pixel data pointer of the SDL image is needed. Essentially the SDL image is now transformed to an OGL texture! Briefly, glTEXPARAMETERi(target, texture parameter, parameter value) allocates a certain value to a specific texture parameter. The possible parameters and values are OGL specific and won’t be treated here in more detail. Anyway, again we are concerned about our 2d texture, so the target is GL_TEXTURE_2D. The parameters to be set are GL_TEXTURE_MIN_FILTER and GL_TEXTURE_MAG_FILTER. They are used to define how to treat textures that have to be drawn to a smaller or larger scale. The routine used for this is specified by GL_LINEAR. 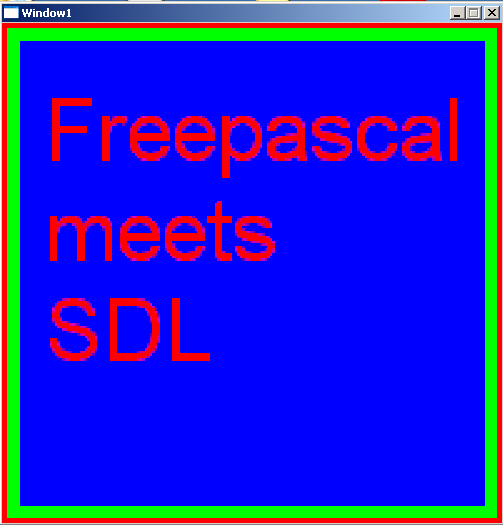 Since the SDL image isn’t needed anymore it can be omitted as known by SDL_FREESURFACE. This part is completely described in Chapter 8. Nothing has changed for this part. In short, the viewport is set up so that the tetrahedron finally can be seen. Now the REPEAT..UNTIL loop is entered which is delayed by 50 milliseconds by known SDL_DELAY. Each cycle the the scene gets rotated by 5 degrees around the y-axis by function glROTATEf. More details about this in Chapter 8. The actual texturing of one of the four triangles of the tetrahedron is now described. Therefore 2d texturing has to be enabled by glENABLE(OGL capability). The capability we would like to enable is defined by GL_TEXTURE_2D. Just as known from Chapter 8 the triangle mode is started by glBEGIN(geometric primitive type) with GL_TRIANGLES. Instead of a color we now define specific texture coordinates which should be allocated to specific vertices. glTEXCOORD2f(s coordinate, t coordinate) is used to define the coordinate of the texture we then allocate to a specific vertex. By the way, even though the official names of the texture coordinates are s and t, they can be considered as x and y values, which is more common for two-dimensional coordinate systems. The values for s and t are relative, so a value of 1 (= 100%) means the full width or height, independent of the actual width or height (32 x 32, 64 x 64, 128 x 256, …), a value of 2 (= 200%) then corresponds to two times the texture’s width or height. The coordinate (s, t) = (2, 2) is allocated to the vertex with the vertex coordinates (x, y, z) = (thh, 0.0, 0.0). Texture coordinate (0, 0) is allocated to vertex (thh, hh, 0.0). Texture coordinate (0, 2) is allocated to vertex (thh, hh, 0.5). Often this texturing process is compared to papering a wall, and indeed there are similarities. The vertex coordinates are exactly the same as for the first triangle in Chapter 8. Finally the geometry definition and the texturing mode is finished by glEND and glDISABLE(OGL capability). The remaining three areas of the triangle are kept as in Chapter 8. Finally the display buffer if swapped after each cycle and the REPEAT..UNTIL loop stopped if a key is pressed in the console. glDELETETEXTURES(1, ogl_texture); DISPOSE(ogl_texture); SDL_QUIT; END. Last but not least everything has to be free’s and closed as known. Anyway, the texture has to free’d by glDELETETEXTURES(number of textures, texture pointer). Then the pointer can be disposed as known and SDL can be quit. The final result should look and behave like this: A tetrahedron consisting of three different coloured areas (cyan, magenta and white) and one textured area is spinning slowly around itself. When pressing a key in the console the show quits.